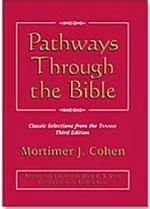 One of The Jewish Publication Society's all-time best-sellers, Pathways Through the Bible: Classic Selections from the TANAKH, has been completely revised and updated for a new generation of readers. In 1946 JPS published the first edition of Mortimer J. Cohen's masterpiece-a careful compilation of classical biblical passages, synopses, and descriptions of each of the Books of the Jewish Bible, prefaced by brief explanatory introductions. Pathways was an immediate success, selling over 250,000 copies through the early 1990s. Bible editor and scholar Rabbi David Stein has updated Rabbi Cohen's beloved book by preserving Cohen's choice of biblical passages and introductory explanations, but he has replaced the 1917 JPS translation of the Bible used by Cohen with the new JPS 1985 translation. While this updated edition shares the same essential features of the original, it is gender-sensitive and congenial to the contemporary ear. Reflective of the sense and sensibilities of our own time, it is a most readable, comprehensible, and enjoyable version of "the most wonderful story that has ever been told. "It's core principle still remains, in Cohen's words, "to be regarded as preparatory to the reading of the Bible itself. Its purpose is to open for you pathways into the magic realm of the greatest literature ever written."